Today I am trying two perfumes from the CB I Hate Perfume line. The fragrances are perfume absolutes in an oil base, and like most oil-based formulas, they stay relatively close to the skin. They are very long lasting, and evolve slowly. Mr. Hulot's Holiday: This fragrance was inspired by the movie of the same name (which I have never seen, but which is now waiting patiently in my Netflix queue). It is described as "the salty breath of the breeze off the sea, driftwood, rocks covered with seaweed and the smell of old leather suitcases". Mr. Hulot's Holiday starts very bright, with the tangy-salty smell of sea air and water. It mellows and deepens over the next hour, adding woody undertones, and later still, a very subtle hint of leather — I'm not sure I would have noticed it if I wasn't looking for that old leather suitcase. I am not usually fond of marine fragrances, other than Comptoir Sud Pacifique's Aqua Motu, which I wear for nostalgic reasons. But this is very nicely done, cheerful and summer-y, and completely without the expansive ozonic-marine note that announces ocean in many fragrances, and that I always associate with air freshener. 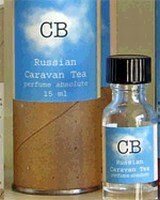 Russian Caravan Tea: Described as "Smoked black Indian tea, bergamot and the hint of shelves full of old books." Like Mr. Hulot's Holiday, this starts very bright. There is lots of citrus, and just a hint of black tea. Over the next few hours, the tea notes intensify and take on the dry, slightly smoky aroma that comes from a freshly opened tin of loose tea leaves. This will be a full-bottle purchase for me, once my wallet recovers from my latest buying spree. I love tea scents, but sometimes they are too realistic (Comme des Garcons leaves series: Tea), sometimes too short-lived (Comptoir Sud Pacifique Ecume de Te), and sometimes there just isn't as much tea as I would like (Elizabeth W Sweet Tea). This is a nice balance between dark and bright notes, and enough of the bergamot remains into the dry down to bring to mind a nice cup of Earl Grey. Tomorrow: CB OUTSIDE (a natural bug repellent) and orange blossom scents from Jo Malone, Bourbon French, and Fragonard. R, I scooted right over to the CB website after reading your interview on Monday, and all the scents sound fascinating! I am especially anxious to try Cedarwood Tea, Russian Caravan Tea, and The Fir Tree. I seem to be the only person in existence who loves and wears Comme des Garcons Tea, so I wonder if the CB Russian Caravan Tea will be too weak and not smoky enough for me. What is the texture of the oil base like? I am generally not a fan of oil formulations, because they are greasy, sticky, unabsorbable, and often the oil smells off and ruins the fragrances for me. We totally need to go to Brooklyn. I've wanted to go there ever since I saw Newsies, anyway. Russian Caravan Tea sounds like something I would like. I have the same problem with tea fragrances you do. Creative Universe Te was not bad though. Cedarwood Tea is an interesting scent, but I am as always so behind. Didn't spend enough time with it to write a decent review. I want to buy the wardrobe version in any case, as we have a real clothing moth problem in our house, and I hate mothballs. You can spray it on your clothes before you pack them away for the season. Russian Caravan tea: guessing it will be too light for you. CdG I love in an abstract way: it smells great to me for a few minutes, after that, I feel like I am drowning in tea leaves. The oil base is comparatively light. The consistency is similar to regular, alcohol-based perfumes (in other words, looks & moves like water in the bottle), but it does leave a bit of a film on skin. I like Creative Universe Te too, and her newer Element of Surprise. This is less green, less sweet. I hate the smell of naphthalene too. Do you know that moth hates the smells of ink they use on newspapers? It really repells them, as I can attest, after I came back from Ukraine and by accident brought a particularly hungry Soviet moth with me. It ate through all of my cashmere and wool. I lined floor and shelves with newspapers, and it seemed to work really well. If you love tea scents, you must try Annick Goutal's Duel, if you haven't already. sorry about the film on skin problem. oil-based absolutes are definitely far longer lasting than alcohol but they take some getting used to. each of these is not only stable but are as close as nature can provide to matching the oil of the human skin – especially Squalane which is the most compatible but annoyingly the most expensive as well. they all bond the fragrance to your skin and allow the scent to properly interact with your own chemistry. Really??? I'll try that too. We seem to get hit every 3 years. Last year was a nightmare, we ended up dry cleaning every piece of wool in the entire house. Ouch. Thanks Christopher! I don't find the “film” objectionable at all. It doesn't stay on top of the skin and then melt in the heat the way my (beloved) Body Time Egyptian Musk does. But nice to know there are other options. Hi T, Duel is a great scent, but the powder-leather-tobacco combination in the dry down doesn't suit me. The dry tea top note is wonderfully done though. Darling, I don't have anything half-way intelligible to write because I got distracted by VIP Room. Are you feeling the same way? Man, I just ordered Mr. Hulot the movie and am so eager to try the scent, too! NST, this is fascinating stuff for the francophile. I haven't tried it either, but I am thinking about picking up the phone to call Franco and order a sample. I'll get one for you, too, okay? Yep, it's a limited edition for $120. And it's an EdT!! Sounds pricey to me…but the raves! Yikes! $120. Oh dear. I don't always love leather, so hoping I'll hate it, but you know I can't resist a sample offer! I'll call him later today and check it out for us. In the meantime, have a great afternoon! The tea one sounds interesting to me too. I love bergamot so it sounds like a winner. I do also love Eliz W.'s Sweet Tea, a summer favorite. I have another Tea scent, it's Italian, but I can't recall the maker right now. The movie looks hysterical. Hope you saw Mireille's movie rec above too. Drat, that drydown is my favorite part. Oh well! Oh now I want to try the line even more! Earl Grey tea is my least favorite tea to drink but I love the way it smells! I can't wait to hear more on this line! smells more like lady grey than earl. lovely. What is Lady Grey tea? Just lighter on the bergamot? Actually it's L'Erbolario Te Verde. Ah! They have a boutique near me, I will check it out. lady grey tea is like earl grey but with citrus. twinings in the peacock blue box. cheers!